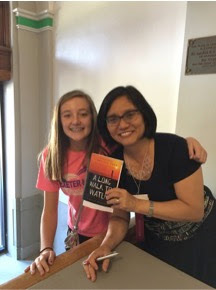 Exeter-Milligan junior high students met Trent Reedy and Linda Sue Park at the Plum Creek Literacy Festival on September 23. These published authors shared their insights on writing and reading along with other authors and illustrators brought together by Concordia University in Seward, NE. 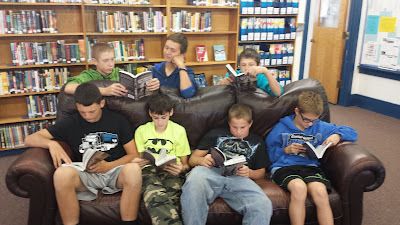 Students in 7th Grade read A Long Walk to Water, by Linda Sue Park. This true story chronicles the challenges of Salva Dut, one of the Lost Boys of South Sudan, who was forced to flee his country during their civil war. A parallel story is also told of the current crisis in South Sudan. Nya, a young Sudanese girl, spends her days carrying water for her family and livestock. The two stories then merge when Salva, the founder of Water for South Sudan, comes to Nya’s village to drill a well. Briana Capek: I liked Trent Reedy the best because he told about his life story and you could tell it was real because he even cried. He told about all of his books and they all sounded interesting. I learned that it takes a really long time to write a good book and it has to go through a lot of different stages and versions. He was very inspirational. Kole Svec: My favorite was Trent Reedy. I liked him because he talked about football a little. He also likes the Hawkeyes so he has some issue. He went to Afghanistan after the 9/11 attacks. He said that writing takes a lot of time and you are going to make thousands of mistakes while you write. Daisy Kanode: Trent Reedy was one of the speakers at the Plumb Creek Literacy Festival. He got most of his ideas for his books from being in the army. He told us it was a very long process to get a book published. It takes a lot of patience to be a good writer. He also said it might be easier to write a book if you keep a journal. The last tip he gave us was that errors help you become a better writer so don't give up and keep making to book better. Another author that talked to us was Linda Sue Park. She told us that most of her books didn't just come from one idea. They have ideas from all over all put together in one. She gave us a lot of great tips too. I liked both of the authors very much but I liked Trent Reedy just a little bit more. Blake Meyer: I like Trent Reedy because of what he told us that it is difficult to become a writer. I also liked Trent Reedy because of the stories that he told us about Afghanistan. I learned that is hard to become a writer. I also learned that it takes a writer about 4-5 different drafts before they publish the final copy. I learned it takes a long time to write a story. Linda Sue Park said that reading a paper book stimulates the brain and activates all parts of the brain. She also said that she wrote around 38 books. I liked Linda Sue Park because of the stories she told us. I also like Linda Sue Park because of the facts that she told us.